Mergify: What Actually is the Volkswagen goof-up? It all started on Friday, September 18,2015 as the German Car giant- Volkswagen, came across a billion dollar trouble. The US Environmental Protection Agency along with California based authorities announced allegations on Volkswagen regarding high emission rates from their diesel cars. According to the EPA, the German automaker illegally installed ECU Software (or the 'defeat device'), designed to manipulate the nitrogen oxide emission by diesel-engined 2009-15 year models from the Volkswagen- and Audi- branded cars sold in the US. The software actually detects the time when the cars are undergoing emission testing and rather intelligently enables the emission controls to pass the tests(always!). whereas during normal driving conditions, this emission control system is reduced, resulting in the release of almost 40% times more pollution than allowed by the law. The EPA was alerted of this issue by the International Council on Clean Transportation(ICCT), reporting the results of research done by the Center for Alternative Fuels, Engines and Emissions(CAFEE) at the West Virginia University. 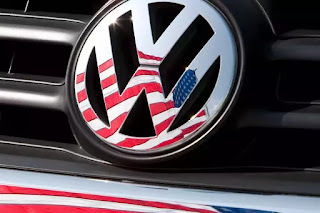 Initially, Volkswagen's public response to the charges popped up on Sunday, September 20, when a spokesperson said that they will be stopping all the US sales of the diesel models affected. The Chairman Martin Winterkorn issued an apology, and said that the Volkswagen would co-operate with the investigators. Since the Canadian rules are more or less similar to the american laws, volkswagen Canada has also stopped the sales of the diesel models. After this 'scandal', the Volkswagen shares have dropped by 20% on September 21. On the next day, a spokesman admitted that the Company has installed around 11 million vehicles with this deceptive software. With this, another 17% of VW's stock price came down. On Wednesday, 23 September, Volkswagen chief executive Martin Winterkorn resigned as a consequence of the Volkswagen defeat device scandal. Volkswagen hired Kirkland & Ellis law firm for defense, the same firm that defended BP during the Deepwater Horizon oil spill. Stefan Bratzel, director at the Center for Automotive Management, a research group, said the damage to VW's image would be as great as the financial fines. Another leading German auto expert, Ferdinand Dudenhoeffer, agreed. "It will be tough for VW to regain its credibility in the United States after this incident," he said. In the US, Edmunds.com analyst Jessica Caldwell said "it is in Volkswagen's best interest to publicly address steps to fix this mess as soon as possible before it loses its customer base for good." German Economy Minister Sigmar Gabriel expressed confidence that VW would clear up the matter quickly and thoroughly. And he insisted the reputation of "Made in Germany" technology would not be tarnished.